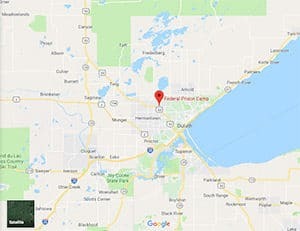 Location: FPC Duluth is located on the southwest tip of Lake Superior, halfway between Minneapolis-St. Paul and the U.S.-Canadian Border; 7 miles north of Duluth, off Highway 53 at Stebner Road. Background: FPC Duluth was previously the Duluth Air Force Base, and opened as a prison in 1983. Notable inmates include former MLB player Jerry Koosman (released in 2010 after serving 6 months for federal tax charges) and political campaign contributor Stuart Levine (released in 2016 after serving 5 years for money laundering and mail fraud). Housing: Inmates are housed in two-person, three-person, and four-person cubicles within the five dormitories. Health Services: Health services available to inmates include sick call, x-rays, lab, dental services, and a pharmacy. While emergency medical care is available 24 hours a day, inmates must submit a triage form to be seen by a health care provider for non-emergency needs. Psychology Services: The FPC Duluth Psychology Services Department consists of two psychologists and five drug treatment specialists available Monday through Friday. Inmates can reach them via cop-out (inmate request to staff), open-door policy, mainline, and through referral from staff. Individual appointments are scheduled by call-out, and inmates are required to check the call-out schedule daily for appointments. If there is an emergency, staff may be contacted at any time, and a psychologist will be contacted. Residential Drug Abuse Program (RDAP): A Residential Drug Abuse Program (RDAP) is available at FPC Duluth. The facility also offers a drug education program and a Non-Residential Abuse Program (NR-DAP). Education Services: FPC Duluth provides GED and English-as-a-Second Language (ESL) programs. Incentives are provided for continued effort and excellence as well as to reward the successful completion of an educational activity. The facility also offers a parenting program and Adult Continuing Education (ACE) classes. The ACE Program offers classes in the areas of foreign languages, math, business, and real estate, although classes vary from quarter to quarter. High school diplomas and post-secondary programs are available through paid correspondence programs. Advanced Occupational Education: FPC Duluth offers advanced occupational education courses in Construction Tech/Carpentry. Vocational Training: No vocational training is offered at FPC Duluth aside from its advanced occupational education and apprenticeship programs. Apprenticeship: FPC Duluth offers apprenticeships in Dentistry, Electrical, HVAC, and Plumbing. Library Services: The leisure and law libraries are open daily for inmate use. The leisure library has daily newspapers, periodicals, reference books, and magazines for inmates to read and view. Inmates can also check out books. The law library is electronic and inmates have access to typewriters and a copy machine. UNICOR: FPC Duluth does not house a UNICOR facility. Commissary: Inmates can spend up to $360.00 per month in the commissary, where they can buy food, snacks, candy, sodas, drink mixes, clothing, electronics, and shoes. Recreation Services: FPC Duluth offers a gymnasium with basketball, volleyball, racquetball, indoor soccer, handball, and cardiovascular conditioning equipment. A theater screens movies, and an activity center houses pool tables, ping pong table, a card room, and some casual literature. A hobby craft area offers ceramics, painting, drawing, and leathercraft. Many outside activities are available for inmate use, including a softball field, soccer field, bocce courts, horseshoes, handball, and a walking track. Inmates may listen to selected CD’s using a personal radio through a system that broadcasts within the Activity Center, Gymnasium, and outdoor recreation areas.